More than 80 leading international pharmaceutical, generics, diagnostics and biotechnology companies, as well as key industry bodies, have come together to call on governments and industry to work in parallel in taking comprehensive action against drug-resistant infections – so-called ‘superbugs’ – with a joint declaration launched today at the World Economic Forum in Davos, Switzerland. The statement sets out for the first time how governments and industry need to work together to support sustained investment in the new products needed to beat the challenges of rising drug resistance. 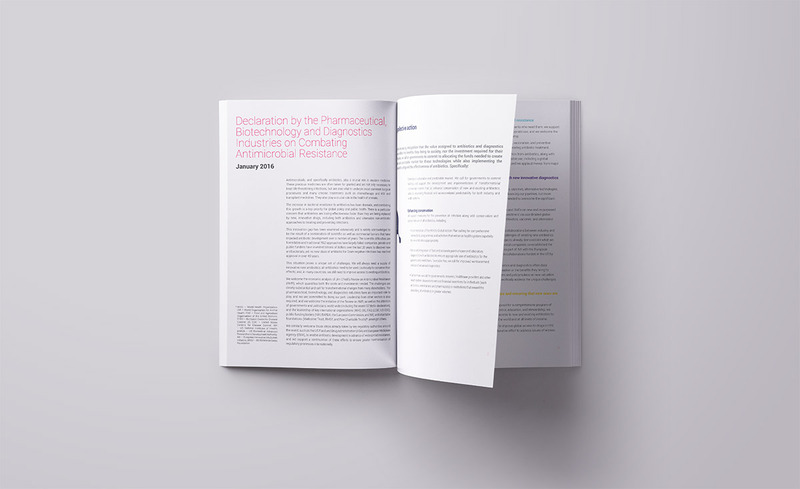 The Declaration on Combating Antimicrobial Resistance – drafted and signed by 85 companies and nine industry associations across 18 countries1 – represents a major milestone in the global response to these challenges, with commercial drug and diagnostic developers for the first time agreeing on a common set of principles for global action to support antibiotic conservation and the development of new drugs, diagnostics, and vaccines. The industry is calling on governments around the world to now go beyond existing statements of intent and take concrete action, in collaboration with companies, to support investment in the development of antibiotics, diagnostics, vaccines, and other products vital for the prevention and treatment of drug-resistant infections. In what the Review on Antimicrobial Resistance recognises to be a notable step for the industry, the signatory companies call on governments to work with them to develop new and alternative market structures that provide more dependable and sustainable market models for antibiotics, and to commit the funds needed to implement them. These mechanisms are needed to provide appropriate incentives (coupled with safeguards to support antibiotic conservation) for companies to invest in R&D to overcome the formidable technical and scientific challenges of antibiotic discovery and development. These include mechanisms to ensure that, where appropriate, the pricing of antibiotics more adequately reflects the benefits they bring; and novel payment models that reduce the link between the profitability of an antibiotic and the volume sold. An integral part of these models is a reduced need for promotional activity by companies. 1 This reflects the final confirmed number of signatories at the time of publication, and updates the figure used in earlier versions of this press notice. Improve access to high–quality antibiotics for all. In light of the gaps that remain in global access to our existing antibiotics and vaccines, and the importance of ensuring that new generations of products are available to all those who need them, the signatories commit to supporting initiatives aimed at ensuring affordable access to antibiotics in all parts of the world, at all levels of income. By bringing together such a wide range of companies in this unprecedented way, the Declaration provides a valuable roadmap to guide further collaborative efforts between industry, governments and NGOs in the global fightback against AMR. The Review will continue to work to drive progress towards a series of key international milestones in 2016 – including likely discussions on AMR at the UN General Assembly and as part of China’s G20 programme in the autumn – and in support of progress against the WHO Global Action Plan on AMR. For further detail and background relating to the Declaration and the work of the Review on Antimicrobial Resistance, please see Notes for Editors on page 8. We welcome the leadership provided by Lord O’Neill’s Review on AMR, applaud the ongoing global efforts to ensure a sustained pipeline of new therapies is developed and are proud to support this endeavour. The Declaration’s call for collaborative action on new commercial models is timely. Industry is ready to engage with governments to develop alternative market structures to enable the sustainable investment that is necessary if we are to overcome the formidable technical and scientific challenges of antibiotic discovery and development. Antibiotic resistance is the sort of global healthcare challenge that this industry should be using its expertise to tackle. That’s why I’m so pleased to see such a broad range of companies committing to this declaration. At GSK we have a long heritage and expertise in antibiotics, we’ve been researching and providing these medicines since the Second World War and we remain committed to continuing in this area. I’m proud that in spite of the scientific challenges of antibiotic research, we still have an active pipeline, which includes a potential new and first-in-class treatment entering late stage development. Antibiotic resistance is an urgent public health issue requiring a comprehensive, global approach. Assuring availability and proper use of effective antibiotics are shared responsibilities and we fully embrace the principles outlined in this declaration. The growing problem of antimicrobial resistance requires new approaches and a heightened commitment to development of new treatments and vaccines. Pfizer applauds this declaration as a balanced and robust approach to stimulating R&D through market based incentives, and emphasising the importance of responsible stewardship. Finding solutions to meet this major challenge requires full participation of private and public sectors, non-governmental organisations, regulatory organisations and payers. It will be challenging as antibiotic stewardship must be improved and discovery of new treatments has been elusive. Although sustainable business models remain to be found, we are up for the challenge. Together I believe we can overcome these hurdles and Sanofi is fully committed to this global effort. Shionogi has been seriously committing to combat AMR for years. Thus, I am pleased to support the declaration from industry, and our company will further contribute to this global challenge as much as we can. I welcome this Declaration as a clear sign of industry’s collective commitment to beating the threat of antimicrobial resistance, both by reducing unnecessary use of antibiotics and supporting the development of new ones. The European Society of Clinical Microbiology and Infectious Diseases (ESCMID) – an independent, non-profit society with a major focus on AMR – welcomes and applauds this broad initiative from industry to embrace all tough commitments necessary to successfully combat antimicrobial resistance. Fair, transparent agreements between industry, governments and the profession will be welcomed by all. The Infectious Diseases Society of America (IDSA) applauds the global industry leaders who issued the Declaration on Combating Antimicrobial Resistance. IDSA members are on the front lines treating increasing numbers of patients who suffer from infections caused by multi-drug resistant pathogens, and we have long called for a coordinated effort by all stakeholders to reduce resistance through ID physician led stewardship and to foster the development of urgently needed new antibiotics, diagnostics, and vaccines. We welcome industry’s commitment to work with us, government leaders, and others to address this growing public health crisis. With this statement, my member companies confirm their commitment to new business and valuation models for antibiotics, including those where you at least partially de-link revenues from sales. This will support the dual goal of incentivising research, while limiting consumption to when it is really needed. When David Cameron announced the AMR Review work in July 2014, he called for ‘a stronger, more coherent global response, with nations, business and the world of science working together to up our game in the field of antibiotics’. With this global Declaration of Support for Combating AMR, industry has given that response. It is up to us all to make sure that delivers new solutions to address AMR for patients everywhere. There is a doomsday clock ticking, with the effectiveness of antibiotics diminishing at an alarming rate. The potential consequences of the failure to tackle this crisis have already been highlighted by the UK Government’s O’Neill Review, which talks of 10 million extra deaths a year and a tragic reversal of over three decades of progress in treating TB, malaria and HIV. So Redx Pharma wholeheartedly supports today’s declaration and welcomes any efforts made in public and animal health to diminish the unnecessary use of antibiotics. We also share the widely-held view that new ways must be found to support innovation and drug discovery in this critical area. Antibiotic-resistant bacteria, left unchecked, would imperil long-term human stability and development. We welcome the opportunity to bring this life-and-death topic to the forefront at the World Economic Forum 2016. New antibiotics must be developed, and existing ones must be preserved. To this end, antibiotics should be used wisely, and novel strategies to overcome the emergence of resistance encouraged as well. Together with all the leaders and creative minds gathered in Davos, we should and will succeed in defining a future for combating bacterial resistance and better prevent and cure bacterial infections: let’s make it happen. We are proud to be part of this important declaration. Antibiotic resistant infections claim at least 50,000 lives each year across Europe and U.S. alone. We will continue to aggressively pursue new models for antibiotics that will curb this worldwide problem. Fedora Pharmaceuticals shares the signatories’ commitment to combatting antimicrobial resistance through innovation, stewardship and improved access. We applaud the collaborative spirit expressed by these companies in coming together to address this incredibly important global health issue. Alere is proud to support this declaration and is committed to improving the uptake of rapid point-of-care diagnostics, helping healthcare professionals make the right antibiotic prescribing decision, and addressing the global threat of antimicrobial resistance. Strongly involved in the fight against antimicrobial resistance, the diagnostic industry strives to develop rapid and high medical value tests in close collaboration with healthcare professionals. Building on more than 50 years of expertise in the diagnosis of infectious diseases and its leadership position in microbiology, bioMérieux is an strong advocate for the development of innovative, rapid and beneficial diagnostics in order to facilitate the rational use of antibiotics and curb global resistance. True to our pioneering spirit, we are proud to sign this joint Declaration and place great hope in the outcomes of such an unprecedented collective call to action to protect public health worldwide for the years to come. Wockhardt has over the years made focussed investments in antibiotic discovery and development, culminating in a pipeline of novel antibacterial drug candidates to effectively manage the AMR issue. Wockhardt expects governments’ help in creating a sustainable economic model for antibiotic R&D. The work being done by this committee is of particular relevance to India, where the overuse of antibiotics needs to be curbed. There is a dire need for novel therapies that overcome drug resistance. To support R&D today, is to save lives tomorrow. We welcome global efforts to combat antimicrobial resistant such as the activities under this declaration and will continue to struggle with the problem for public health. The ever-growing threat to world health from antimicrobial resistance cannot be tackled unless industry and governments around the world work together in new ways. It’s fantastic to see so many key organisations already signed up to the declaration and the UK innovation ecosystem has a lot to contribute to this global challenge. 1. Antimicrobial resistance (AMR) is the natural process by which bacteria and other microbes develop resistance to the drugs commonly used to treat them. Antimicrobials include antibiotics (which act only on bacteria), antivirals, antiparasitics and antifungals. The independent Review on AMR, chaired by the economist Lord Jim O’Neill, estimated in 2014 that without effective global action, the rise of AMR could claim 10 million lives globally each year by 2050, and result in a cumulative loss from global output of 100 trillion USD. 2. The growth of resistance to antibiotics represents a particular threat to modern healthcare. We rely on effective antibiotics to treat common infections and to ensure that other medical procedures (such a surgery or cancer chemotherapy) remain safe and routine, but a combination of scientific, regulatory and commercial challenges has meant that the discovery of new antibiotics in recent decades has failed to keep pace with the rise of antibiotic-resistant infections. Meanwhile, we face the dual problems of pervasive over-use and misuse of antibiotics and other antimicrobials in animals and humans in most parts of the world – something that exacerbates the development of drug resistance – and a lack of affordable access to antimicrobials in others. 3. The Declaration by the Pharmaceutical, Biotechnology and Diagnostics Industries on Combating Antimicrobial Resistance marks a major step forward in the global battle against the growing problem of AMR. It reflects and welcomes the progress towards a comprehensive global response to AMR made by governments over the past 18 months in major multilateral forums including the World Health Organization (WHO) and the G7, and the contribution to these efforts provided by the work of the Review on AMR and other key international organisations. 4. The Declaration has been signed by 85 companies (74 pharmaceutical and biotechnology companies, and 11 diagnostics companies) and nine industry associations from 18 different countries. This final count reflects the number of signatory organisations at the point of launch, and updates the figure included in earlier versions of this press notice. The Declaration remains a living document, with signatories free to add or remove their endorsement at any time. 5. The Declaration text was collectively drafted and agreed by its signatory companies. The Review on Antimicrobial Resistance is not a signatory to the Declaration but it has assisted its development and supports its aims. The Review has agreed to host the Declaration on its website (www.amr-review.org/industry-declaration – page live from Thursday, January 21) on behalf of the signatory companies. 6. The Review on Antimicrobial Resistance was commissioned by the UK Prime Minister, David Cameron, in July of 2014 to address the growing global problem of drug-resistant infections. The Review has been exploring in detail the challenges associated with drug resistance over the past 18 months, working extensively with companies, NGOs and governments around the world to identify the interventions required to overcome these challenges and to reinvigorate antibiotic discovery and development. The Review will deliver its final report and recommendations by the 9 summer of 2016, and has so far published a series of interim reports looking at individual aspects of AMR. 7. The Review is Chaired by Lord Jim O’Neill and backed by the Wellcome Trust and the UK Government, although operates and speaks independently of both. Lord Jim O’Neill is also the current Commercial Secretary to HM Treasury, but chairs the Review in an independent capacity. He is an internationally published economist and until 2013 was Chairman of Goldman Sachs Asset Management, having previously been the organisation’s Head of Economic Research. The Wellcome Trust is providing part-funding for the work of the Review, and hosting the team at its London headquarters.